I woke up feeling pretty good about how I did at the KPMG Front Street Mile Race the night before. It was a solid first race of the year and vastly different from the first race I ran in 2014. Let’s just say that race didn’t go according to plan. 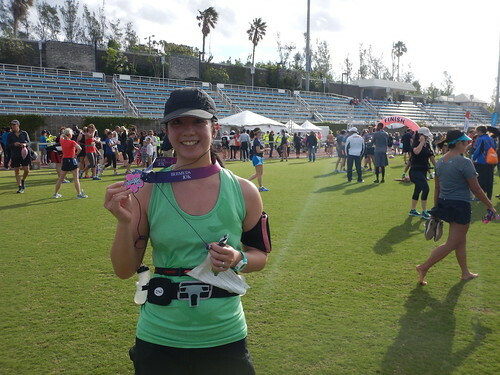 The second part of the Bermuda Triangle Challenge was a 10k race that took place at 9 a.m. I had plenty of time to get ready. 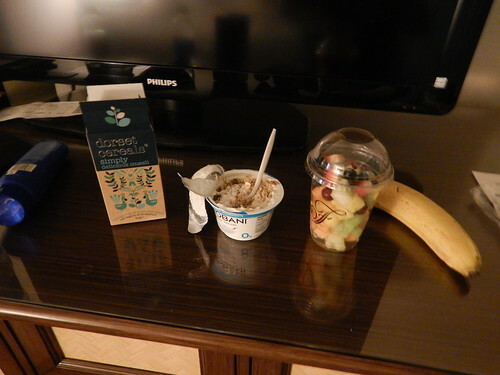 For breakfast I ate yogurt, fruit and some muesli that I had brought from home. 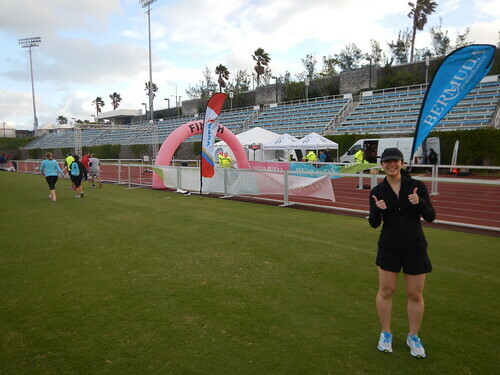 Me by the finish line before the race started. I was visualizing the finish. My breakfast. I still got hungry partway through the race. What can I say? I eat a lot. We made our way down to the lobby and it was a short wait before we got onto the shuttle. I asked the shuttle co-ordinator about transportation back from the race and she said “There will be taxis available for you to take back.” I guess she learned to be clear that we would have to pay for our transportation back from the race. The 10k takes place at the National Sports Centre. I was glad we had the shuttle bus and didn’t have to think about figuring out how to get to the race. I saw a lot of runners walking to the race along the way. Dan and I pose for a selfie on the shuttle bus. 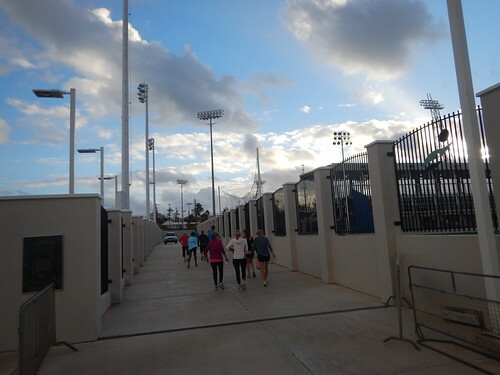 Following other runners into the stadium. 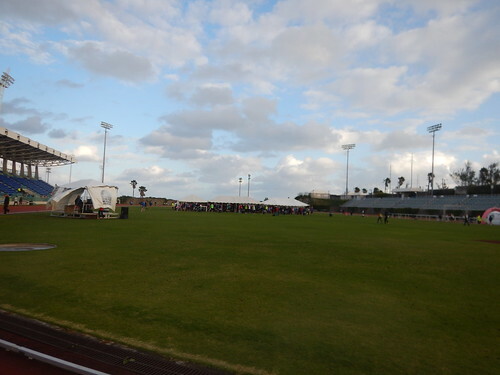 When we got to the stadium it was extremely windy and everybody huddled in one of the tents. I took advantage of the track and warmed up on it. It was cold but I knew that once we got running it would get better. We were taking some pictures when a couple dressed as pirates approached us and asked if we could take their picture. As Dan was taking their picture I realized that I recognized them. “Are you Karla?” I asked and the woman replied that she was. It was Karla Bruning of Run, Karla, Run! and her husband Phil. I follow her blog and had read that she was participating in the race (she even had a code to get 20 per cent off but I had already signed up), but I never thought that I would meet her. I told her that I read her blog and we took our picture together. We chatted for a bit about the one mile race the night before and then went back to warming up. I should have known by their amazing pirate costumes that it was them. If you check out her blog you’ll see all of the awesome costumes she runs in (mostly at RunDisney races). Most runners took shelter in the tent to stay warm from the wind. 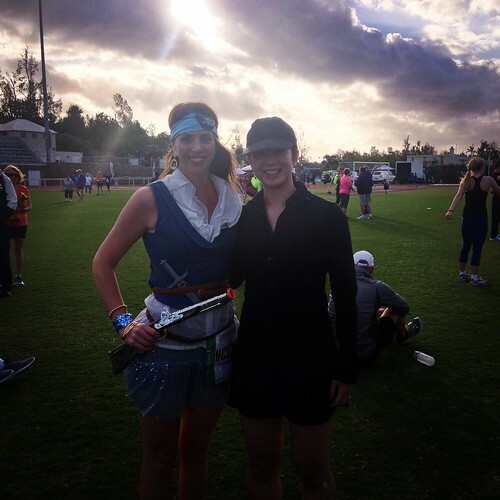 I met Karla Bruning from Run, Karla, Run! Look at her awesome pirate costume! When it was time to start the race we left the stadium and stood on the road. They didn’t have corrals so I found a spot in the middle. A girl in her twenties saw my race bib, which had a wave number written on it since it was a Challenge bib and looked confused. Her aunt explained that I was doing the challenge and the girl said “I ran the Princess half last week. That was my challenge.” I heard her mention that she was going to take it easy for the 10k because she had some muscle pain. I thought about that later on the course when she ran past me as we went up a hill. Strong runner. We started the race and it was beautiful. I immediately regretted not running with my camera. People were out cheering for us and I heard somebody nearby mention that the 10k was more challenging than the half. I soon found out why. There were so many hills! My plan for the race was to try to finish in about an hour. I would have liked to finish in under an hour but I wanted to save my legs for the half the next day. The course was beautiful but challenging. The hills tested my mental toughness but every time I thought about walking I thought about all of the hills I had run up that winter in -30 C. I didn’t run all of those hills in the cold to walk up a hill in Bermuda! At around 7k my stomach grumbled. I was making good time but starting to feel hungry, which is never a good sign. I tried to concentrate on other things and the next few kilometres crawled by. With one kilometre to go I knew that I was close to finishing in under an hour and then I hit a hill . After I ran the hill I thought I still had a chance but then I hit another hill. I ran that hill and still thought I had a chance until I realized there was yet another hill! After this I knew it wasn’t going to be under an hour, but I was ok with it. I ran back into the stadium and crossed the finish line in 1:00:35. Even though this wasn’t a PB I was very happy with this time. It was a challenging course and this time was actually 5 seconds faster than my 2014 Yonge St. 10k race time, which is a mainly downhill course. It was a good indication of things to come (for the record, I later crushed it at the 2015 Yonge St. 10k). It was satisfying to know that my hard work was paying off, though part of me worried about how the half marathon would go the next day. 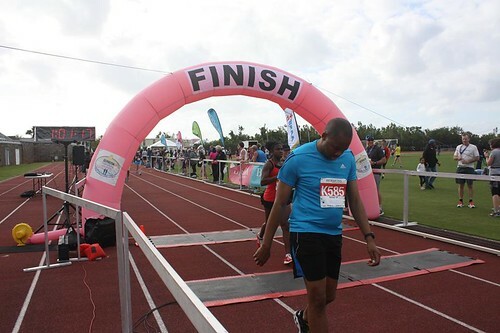 I found this picture of me finishing the 10k on Bermuda Timing’s Facebook page. If you look closely you can see my face in the background. Two down, one more race to go! Getting back from the race was easy. We shared a cab with other runners who were headed to the same hotel and our driver was incredibly friendly. She even stopped along the road so that we could take pictures of Horseshoe Bay Beach. After a quick shower we had lunch at the Jasmine Lounge where we took advantage of their Restaurant Week menu. 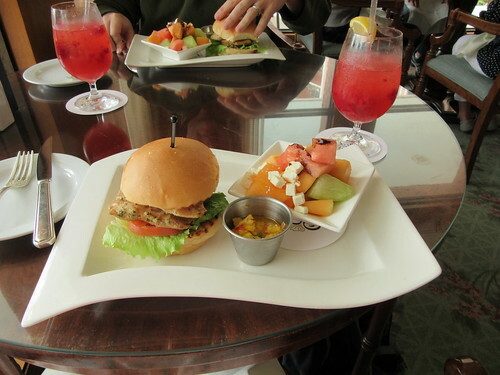 My lunch was a grilled mahi mahi burger with a tropical salsa and a melon salad. 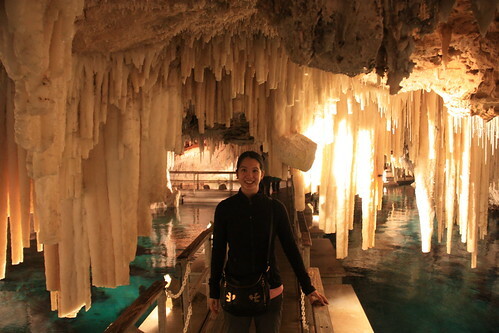 Our next stop after lunch was a visit to the famous Crystal Cave. The cave was amazing and our guide was extremely informative. He let us know that the cave was discovered in 1905 by two 12 year old boys who found the cave when they lost their ball in it. He even shut off the lights to show us what it looked like inside the cave. It was pitch black. Those boys were brave. Me standing with two stalagmites called the icebergs. They’re over 30 feet tall and about 1.4 million years old. 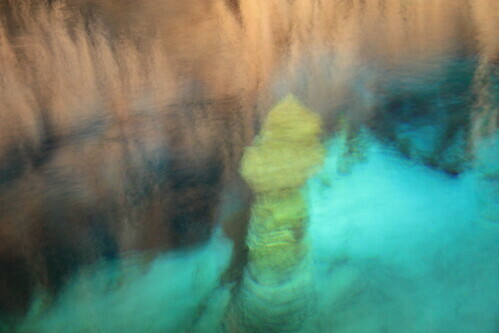 This stalagmite in the water is called the lighthouse. It’s over 14 feet tall! Me in the Crystal Cave. I highly recommend visiting it! After the caves we walked over to The Swizzle Inn to sample the original Rum Swizzler and have dinner. My friend Alice had recommended The Swizzle Inn and I was looking around when I recognized a logo on one of the business cards sticking out of the ceiling. I took a better look and then realized that it was Alice’s business card! Of all the tables to sit at, we were sitting right under her card. It was fate. 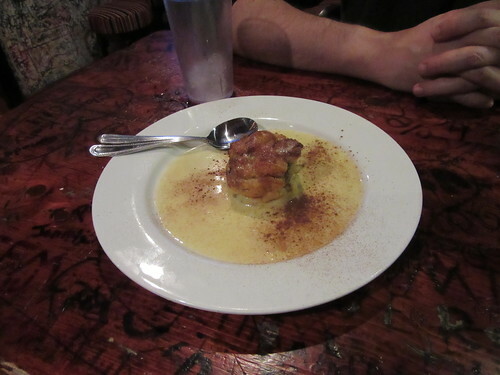 I also had the best dessert of my trip here; banana chocolate bread pudding. Yum. My banana chocolate bread pudding. 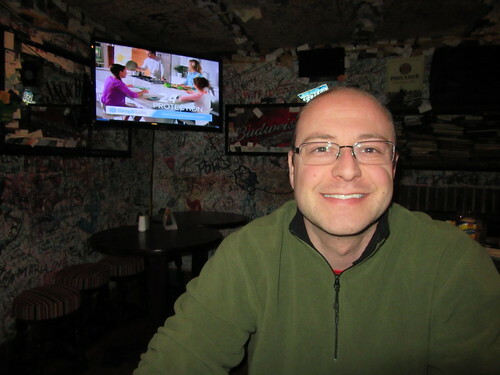 Dan in The Swizzle Inn. It was covered in business cards. 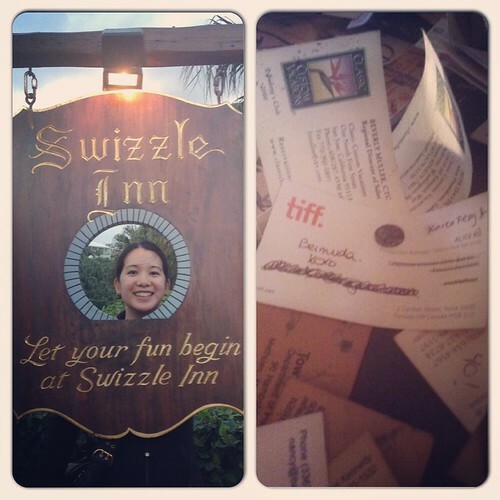 I still can’t believe we sat under Alice’s business card in the Swizzle Inn and that I saw it. It was fate! Overall it was a good day but I still had to mentally prepare myself for my final race of the weekend. 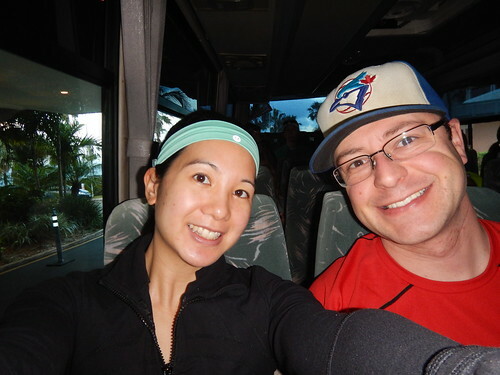 We went back to the hotel to relax and get ready for my half marathon the next day. Race recap coming soon. Isn’t Karla nice? I met her once at an event by accident too. I spotted her and asked, “Are you Karla?” This seems to be a running theme. Looks like a fun race! 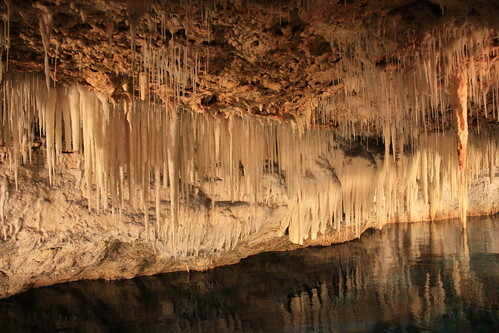 What a cool cave. 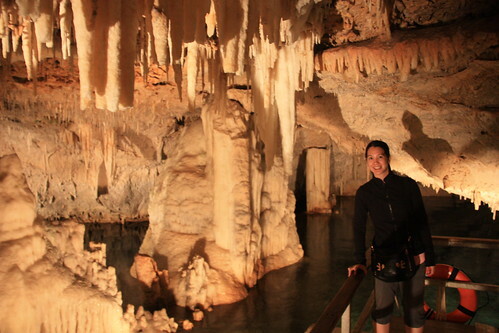 I love caves, especially when I can go spelunking. She is so nice! I bet she gets the “Are you Karla?” question all the time. 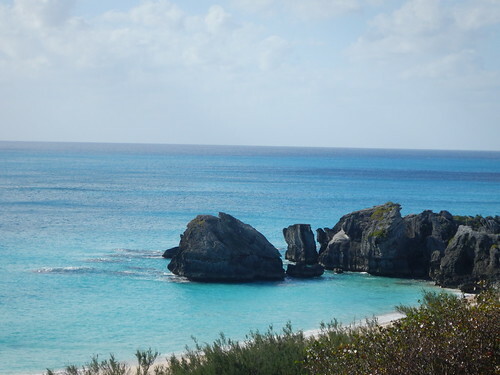 🙂 There are a lot of caves to explore in Bermuda (even some that you can swim in). We didn’t have time so we just picked their most famous cave to visit. It was cool!